We strive to keep the fine print to a minimum and to have all of our policies be fair, easy to understand, and mutually beneficial. We love doing business on just a handshake. On new and used items (non-consignments), customers have 10 days to return for exchange, store credit, or refund. The item must be in the same condition as when purchased, and accompanied by the original receipt. A restocking fee will be applied to any items with damaged or missing packaging, damaged or missing accessories (including manuals and paperwork), or showing signs of wear and use. 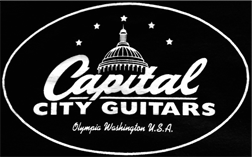 Restocking fees will be applied at the sole discretion of Capital City Guitars. Some items are non-returnable, including: books, DVDs, and other media; microphones; earplugs and other in-ear products; software; throat spray, talk-box effects, mouthpieces, reeds, and other mouth-related products; tubes; headworn items; harmonicas; DJ/Recording gear, and consignments. Tell me about your Repair Services. We complete repair work on a first-come-first-serve basis and strive to be as efficient as possible. Turnaround times are not guaranteed and may be extended if parts need to be ordered. Please allow time for gear check-in - we inspect condition, accessories, functionality, and write up an accurate Work Order before we accept responsibility for your gear. Any quotes made at this time are estimates and may change once work has begun. A deposit will be assessed on check-in and applied in full to the repair charges; you will be asked to pay the remaining balance when the work is done and your gear is ready. If additional problems or issues arise with your gear (beyond what was diagnosed when checked in), no additional work/charges will occur without your permission. If the same issue that we fixed arises again soon after you take it home, we will re-open the Work Order and fix the problem again at no additional charge. If a new problem arises with the same piece of gear, we consider it a separate repair issue and will open a new Work Order. You are responsible for keeping contact information current. If 90 days have passed since your repair was completed and multiple attempts have been made to contact you, the item will be forfeit and sold to recoup costs. What is your policy for canceling lessons? We require 24-hr notice by phone for any cancelled lessons. You may send a friend or family member in your place if you are unable to attend your scheduled time. We offer in-store layaway on all new and used items. 20% per payment, interest-free, 20% deposit. Does not apply to services or consignment items. The item(s) will remain in our store until paid in full. There is no penalty for prepayment. If you are delinquent on a payment, we will contact you and ask you to catch up on terms. If we are unable to reach you, your deposit will be forfeit and the item will be put back out for sale. I hear you do consignments. How does that work? Consignment is a popular way for musicians to sell gear through our store. We research your item and assist you in selecting a competitive, fair price to ask. If offers are made below the asking price, we contact you, most often by phone, to give you the opportunity to accept, reject, or counter the offer. When your item sells, we process the sale with a commission on the final sale price. We have since day one only charged 20% for Consignments. Can I special order an item you don't currently have in stock? We are happy to place special orders with any of our manufacturers! We will still beat any price from another reputable dealer, even online, will save you the shipping costs, and will perform a full setup on all instruments. So that Special Order items are processed in a timely fashion, we ask a non-refundable 50% deposit be made when you place the order with us.